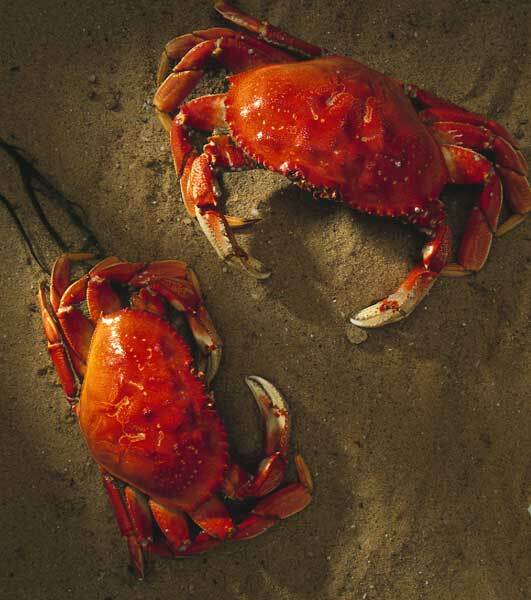 Crustaceans - Dungeoness, King, and Snow Crabs by Marinelli Shellfish Co. Select the photo to see a larger image. Season: Season – Year round, peaks December – April. Dungeness crab are members of the rock crab family and take their name from the fishing village of the same name located along the Washington state side of the Straight of Juan de Fuca. They range from central California to Alaska and are caught with round steel and wire traps in depths usually ranging from 10 to 300 feet. They are the most commercially important species along the west coast except for Alaska. Fishery management regulations require a minimum shell width of 6.25 inches, and only males may be taken. Females and young males must be returned to the sea alive. Typical whole weight is usually between one to three pounds. Dungeness crab have a very high meat yield, about 25 percent, and are sold live, whole cooked, in sections, and as picked meat. Their shells turn pinkish red when cooked and the meat has an appealing sweet flavor that is very popular. Season: Year round frozen. Peak season November – December. 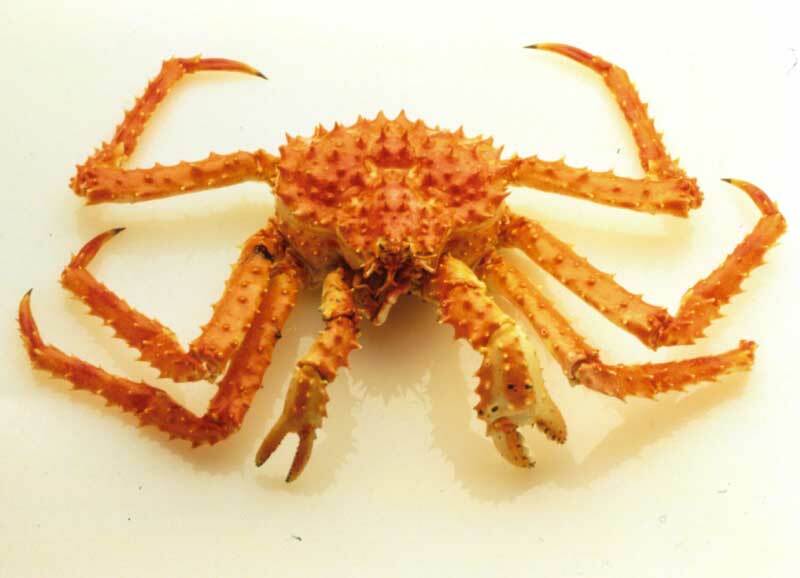 King crab is the market name for three different species of crab, although the most common of the three, and the most sought after, is the red king. In addition to the red, there are also blue (P. platypus) and brown, which are sometimes called golden (Lithodes aequspina). They range from southeast Alaska, through the Bering Sea, and down to the Sea of Japan. Harvests are restricted by quota, which are adjusted annually based on prior landings and surveys. They are caught in large wire mesh traps in depths ranging from about 400 to 600 feet. They prefer flat sandy bottoms and often travel in large groups. Typical whole weight is usually between five to ten pounds and they may grow up to seven feet from leg tip to leg tip. 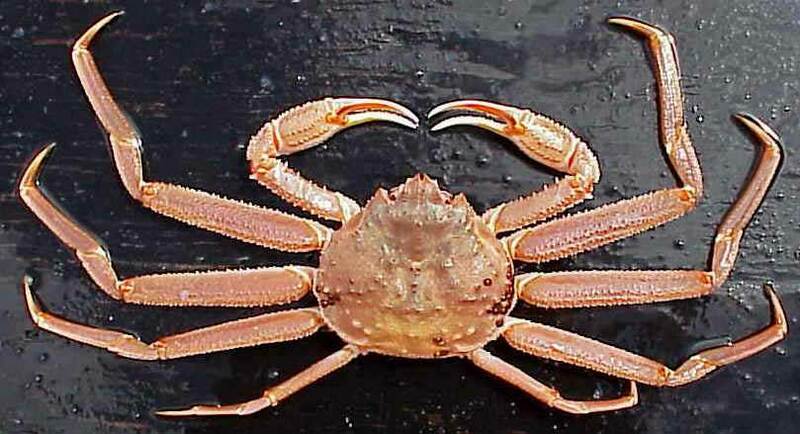 King crab are unique in that they have only three walking legs and two claw arms, while most species have a total of ten appendages. Most king crab is sold pre-cooked and brine frozen, although a niche market is emerging for fresh sections during the harvest season. Their shell turns bright red or orange when cooked, and the meat is sweet, firm, moist, and rich. Peak season for C. opilio - January thru March, for C. bairdi – November.